Since 2006, when the Mexican government declared war on the country’s powerful drug cartels, Mexico has witnessed a horrible descent into violence and terror that has been exacerbated to an alarming degree by widespread government corruption. In what’s perhaps the most notorious atrocity of this terrible period, 43 male college students were abducted and presumably murdered by a combination on police and cartel gunmen. The 2014 crime has never been solved, and every time a new report is issued, it’s followed by charges of a government cover-up. This systemic collusion between criminals and the authorities is at the heart of “Tempestad,” which concerns crimes that are much smaller in scope that the students’ disappearance but are chilling enough to indicate how widespread such problems are. Salvadorean-Mexican director Tatiana Huezo focuses on the travails of two women swept up in sudden, Kakfaesque nightmares over which they have little or no control, and she adapts an unusual documentary approach to tell their tales. We begin hearing a young woman named Miriam recounting being released from prison and then beginning a journey back to her home on the other side of Mexico. This, we quickly discern, is close to the end of Miriam’s story, and the film the soon doubles back to chronicle her ordeal from the beginning. Presumably because she declined to appear on camera (for what may be very good reasons), we never see Miriam. As she speaks, Huezo shows us shots of people traveling across rainy Mexico on buses perhaps like the ones Miriam used to get home. Although unconventional, this poetic/experimental tact proves effective because the atmospheric visuals provide a haunting counterpart to Miriam’s harrowing story. She lived in Tulum with her young son and had an ordinary government job processing passports at the Cancun Airport. One day she and other co-workers were arrested and taken to Mexico City, where they were charged with human trafficking. None of the accused, we’re led to understand, had any connection to the crime they were charged with. Rather, they were scapegoats, or “pagadores” (payers) – innocent people who pay when higher-ups decide that something must be done to show that a crime like human trafficking is being combatted. But Miriam’s troubles are only beginning when her conviction is handed down. She’s taken to a prison in Matamoros, near the Texas border, where there seems to be not even a pretense of government control. The prison is run by and for the Gulf cartel, which tortures all inmates as they arrive. That, no doubt, is to soften them up for what comes next. They’re told that unless their families pay to keep them alive, their futures will be very bleak indeed. In Miriam’s case, the criminals demand a $5,000 upfront payment, then $500 a week. Her family is able to comply, so she stays alive. Others are not so lucky. After the film’s initial section on Miriam, it begins telling the story of another, somewhat older woman, Adela; thereafter, the narrative switches back and forth between the stories. Adela’s story is told differently in that she and her family appear on camera, although when we hear her story, it’s mostly in voice-over, like Miriam’s (there’s very little synchronous sound in the film). The visuals here are interesting because Adela is a circus clown and we get see a lot of the colorful life around her performances. At first it’s hard to see what connects Adela’s story to Miriam’s. But after Adela talks about having children and what her kids were like when they were young, it’s revealed that she had a daughter named Monica who simply disappeared some years before when she was a college student. Monica had a close male friend named Jesus and Adela and her family were impressed with how eager he was to assist them. But the authorities were no help and there were suspicions that some may have colluded in having Monica sold into prostitution. Eventually Adela’s family came to suspect that Jesus may have arranged for her abduction. 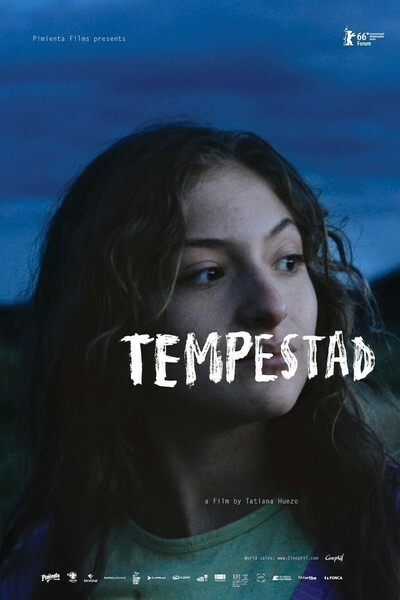 Both of the stories told in “Tempestad” are compelling and very sad. Each woman has had a hole ripped in her life that may be difficult or impossible to mend. But perhaps understanding their tragedies can help prevent others. In showing the emotional impact of Mexico’s ongoing political crisis, Heuzo has provided a valuable reminder of why broad systemic change is needed.